This BIOACTIVE VITAMIN C with many water-soluble forms quickly reaches the organism and effectively supports the body’s resistance, gives energy, deters fatigue, and is important for many other biochemical reactions in the body. Bioactive C vitamins with dark red sour grape Acerola are much better absorbed by the body than usual forms of ascorbic acid. 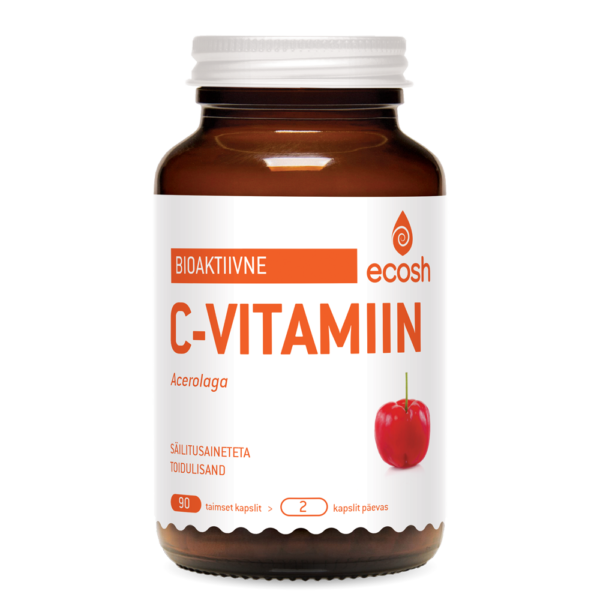 The bioactive forms contained in the Ecosh act gently in the body and unlike C vitamins that are in the form of an acid, these do not irritate the stomach or other internal organs. Additionally, the body can store these forms more efficiently in the adrenal glands, liver, lungs, and also in the intercellular fluid. Acerola cherry also contains vitamins A, B1, B2, B3, as well as calcium, magnesium, carotenoids, and bioflavonoids. Also, vitamin C ascorbate forms contain valuable minerals such as calcium and magnesium. Vitamins and minerals help each other to be better absorbed during metabolism and amplify each other’s effects. Acerola cherry is high in antioxidants and contains more vitamin C than citruses, black currant, rosehip, and sea buckthorn. For example, 100 g of Acerola contains approximately 1,678 mg of vitamin C, but lemon only 57 mg. The antioxidants contained in Acerola slow down the breakdown of sugar, thus helping to prevent sudden fluctuations in blood glucose levels. And bioflavonoids keep your senses alert. Vitamin C is needed to increase the body’s resistance, and to fight off spring fatigue and stress. Helps to have normal psychological functions, normal functioning of the nervous system, and increases iron absorption. In addition, vitamin C contributes to the normal formation of collagen to help with the normal functioning of bones, cartilage, blood vessels, capillaries, teeth, gums, and skin. NB! The product does not contain any bulking substances or any other harmful compounds. The product has no GMOs, artificial flavours, or colouring, and is lactose and gluten-free. Also suitable for vegans. Directions: 2 capsules a day during breakfast and lunch, according to the recommendation of a therapist or a doctor. Take with water. Ingredients: Acerola cherry powder (Malpighia emarginata), magnesium L-ascorbate, calcium L-ascorbate, L-ascorbyl-6-palmitate, vegetable capsule: hydroxylpropyl methylcellulose.